Bosse Heating & Air Conditioning LLC is a leader in central air conditioning systems in Meriden CT.
We are dedicated to providing the best air conditioning services and repair for our customers. From brand new AC installations to, cooling system tune ups and AC system repairs, our technicians are skilled at working on all types of central air systems. It is our goal to ensure your central air conditioning system is working at peak efficiency at all times, thus reducing your utility bill and increasing the comfort of your homes’ air quality. 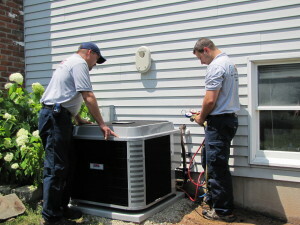 If you are considering a new central air conditioning system, we offer FREE consultations. contact us today at 860-426-0687.